Doppler Radar has never been this handy or convenient for arrow speed measurement. 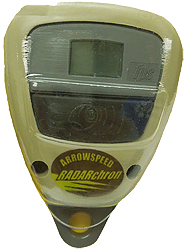 The RadarChron provides microwave doppler accuracy within 2% from 150 to 450 fps. Simple one-button operation; LCD display toggles between hundreds and tens of fps units. Rugged, compact design makes it convenient to carry and use.Attaches to most compound bows via a Radar Adapter which interfaces with the 5/16"-24 threaded mounting holes in the end of most stabilizers. An extension rod is provided to be used in place of, or in tandem with, a stabilizer.No need to set-up awkward equipment, No problems with background lighting, noise, or other environmental effects, measures the speed of metal and graphite arrows. Carry the Bow Radar in your equipment bag or pocket. Use it in the field.